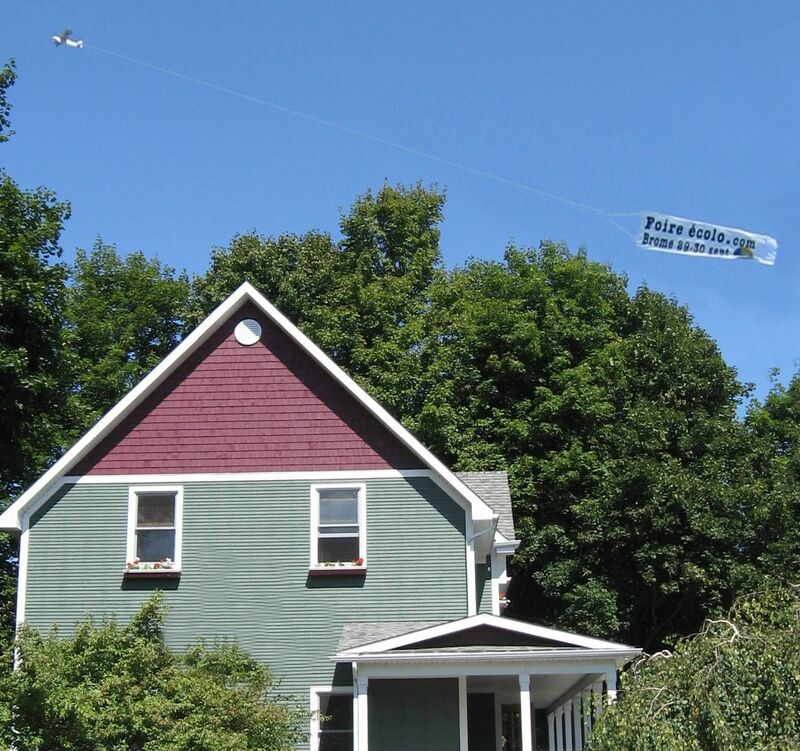 Was it only me who found it strikingly ironic that the folks organizing the upcoming "Ecosphere" gathering had hired an airplane to drag a banner across the sky to advertise their Environmental Fair? I couldn't believe that this group somehow decided that the best way to publicise their environmental fair to be held at the end of September on the Brome Fair Grounds was to get a noisy old fossil fuelled aircraft and buzz incessantly and noisily over Knolwton dragging a barely readable banner across the blue sky! I'm no marketing genius but isn't that a bit like trying to entice people to reduce their risk of Diabetes by having a cheescake eating contest? In fact, and ironically, I had been sitting on my veranda sipping an organic tea reading the glossy color pamphlet that the Ecosphere was using for advertising thinking to myself that such a high-end paper product must have cost alot and probably used a lot of resources to print when I heard what I thought was an airborne chainsaw and looking up expecting to see some barnstorming biplane dragging a banner for the local flea market I was dumbfounded to see it was actually an ad for the Ecosphere. 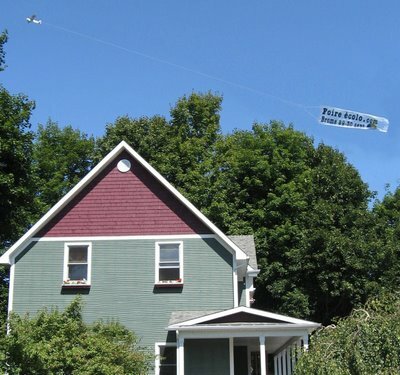 I did some quick math: promoting an environmental fair using thousands of glossy color posters and flyers and expensive adverts in newspapers around Quebec combined with a smoke belching airplane equals...contradiction! Renewable and clean energy is something most of can agree is a goal that should be pursued in these days of concern for global warming and pollution of our planet. Our reliance on fossil fuels is a dangerous dependance and our awareness that our continued use of such energy resources is causing ill-health to the Earth is becoming a reality that none of us can ignore. The media emphasises the "crisis" of our society and warns us to develop new means of "green" energy if we are to support the human population. Developing new sources of energy means that new technologies must come in to play and two local events seem to show two sides to the same coin. On one hand the upcoming Ecosphere is highlighting the newest technologies for a sustainable world and on the other hand a group of concerned artists are warning of the damaging effects of such developments. An interesting contrast is the art display currently running in Frelighsburg which is an exhibit entitled Scale of the Wind A group exhibition that ponders nature, energy and man, which runs until September 16th, 2007. Galerie Design presents 14 architects, designers, and photographers who explore the visual impact of wind energy. A project for the construction of a windfarm in the area seems to have struck a chord with these artists who feel the negative impacts on the environment out-weigh the positive benefits of using the wind to develop clean energy. But is energy really clean? The exhibit seems to focus on the size of the wind turbines and the effect it may have on the area. Certianly any power generation, whether it be a hydro-electric damming of a river or a nuclear power plant, will leave some sort of "crater of localized damage" but the question is does this damage, when it means using renewable resources to create clean energy, justify the project? One of the exhibitors used the term NIMBY or Not In My Back Yard and then went one step further to say Not In Anybody's Back Yard. OK...so where should we build power plants, dams, windfarms and nuclear reactors? If it is not in anyones back yard then I suppose it should be nowhere and we can all go back to typewriters and candles? Ok...you guys go first...I need the power for my Google life! Is this uproar based on the fact that some of these people are faced with the prospect of living in the shadow of windmills to generate electricity? Well, artists are within their rights to disagree with anything they see fit and if their peacfull paradise is somehow threatened by a wind farm then they have a right to protest using their creative talents. But the reality is we all use huge amounts of power and I may not agree with a bank of wind turbines placed on the horizon but we need to generate this energy and while we may not want it in anyones backyard that must be seen as a bit utopic...yes? Where do we put it? Or do we just pull the plug on everyone? 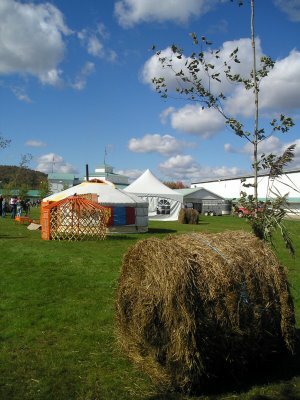 Another somewhat ironic factor is that at the same time this exhibit is taking place the Ecosphere is preparing for their 2nd annual environmental fair in Brome and they seem to be behind wind power as a positive form of power. Even the logo of their website features some of the large scale turbines the artists at Galerie Design condemn. Both groups feature artists yet both groups seemed totally opposed to the same concept...how is this possible? 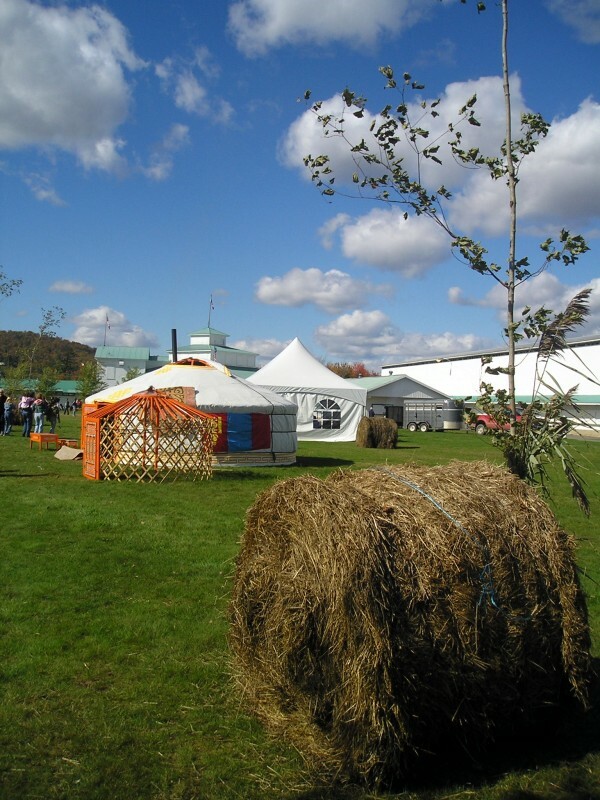 Would that artists involved in Project Ecosphere feel the same about wind farms if they were built right next to their country homes in the Eastern Townships? 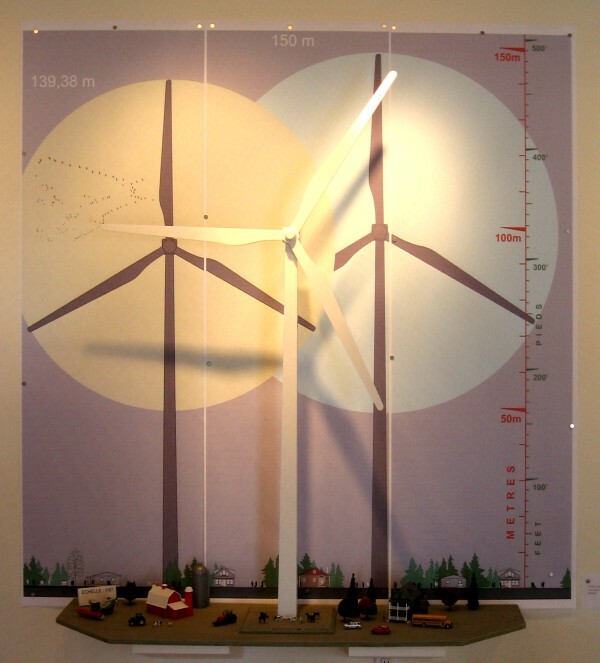 Would the artists contributing to the Galerie Design project feel so inclined to condemn wind power if the wind farm was built on faraway tracts of land? "Green" energy is such a feel-good concept and if anyone objects to the idea of such renewable energy creation they are seen as bad folks who would gladly knock the feet out from under David Suzuki if he were running to catch a bus. But we all need this precious energy! Artists from all sides depend on power to drive their computers and to run the cameras that make them stars and to light their spotlights and create their paints and pastels. in the year 2007 can anyone really think that "Not In Anyone's Back Yard" is a realistic option given the planet's diminishing greenspace and almost viral population growth? Is the message of the Ecosphere Fair partly that that renewable "green" energy is a goal that should be achieved regardless to the consequences on the environment? I don't want a nuclear plant in my backyard nor do I want looming towers of wind turbines in my backyard but...I use the power for my computer, to recharge my batteries and for all my toys so what choice do I have? Should we build these power generating stations in the remote arctic or in the desert or is there even anywhere that deserves to be marred with these sub stations? I would say not but in this modern world where we are literally drinking energy with gusto we have no choice but to accept that we cannot live inside a pristine bubble anymore because there isn't much pristine left out there! You gotta roll with the punches!